ALL INDIA REPORT ON AGRICULTURE CENSUS 2010-11 - Dilli Chalo! For this report, the data collected covered these criteria: (i) distribution of holdings according to the tenancy status; (ii) area under different land use; (iii) distribution of holdings according to the irrigation status; (iv) area irrigated source-wise and (v) area under principal crops. On the basis of the data obtained from 20 per cent of the villages in states with comprehensive land records, the tables in this report document the number of holdings, operated area, and average size of holdings for all social groups, including across a gender axis. The tables also indicate changes over time – from the previous agriculture census (2005-06) to this one. 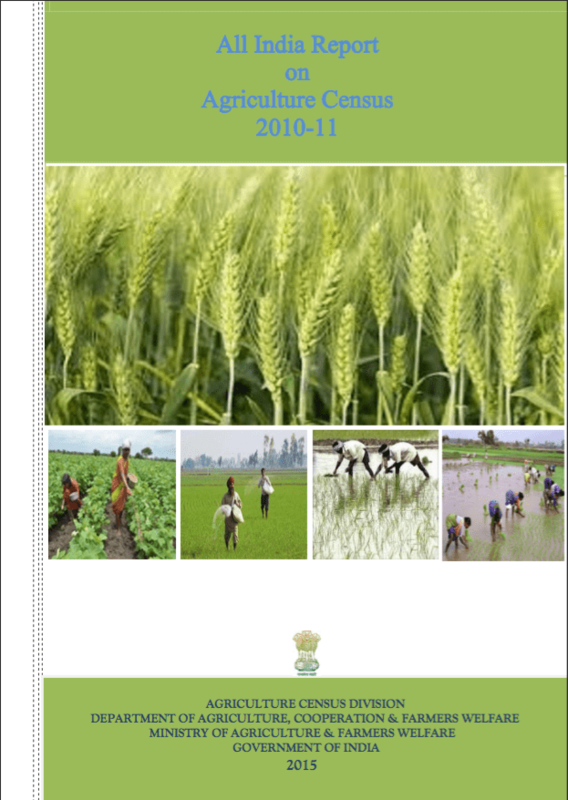 The Agriculture Census of 2005-06 did not cover Bihar, Jharkhand and Maharashtra; of these states, this report covers the number and area of operational holdings for 2010-11 only for Bihar and Maharashtra, and does not include the data for Jharkhand at all. Land holdings across India grew from 71 million in 1970-71 to 138.35 million in 2010-11. Male operational holdings (excluding institutional holdings) constituted about 87.2 per cent of the 138.35 million (88.3 per cent in 2005-06), while female holdings were 12.8 per cent in 2010-11 (11.7 per cent in 2005-06). Of the 138.35 million holdings in India during 2010-11, Uttar Pradesh had the largest number, 23.33 million (16.9 per cent), followed by Bihar 16.19 million (11.7 per cent), Maharashtra 13.70 million (9.9 per cent). And of the 17.68 million female operational holdings, Andhra Pradesh had the highest proportion of 18.9 per cent. The Gross Cropped Area was 193.76 million hectares; excluding Jharkhand, where the Agriculture Census 2005-06 could not be conducted, it dropped to 161.31 million hectares in 2010-11 (152.61 million hectares in 2005-06). The average size of holdings in 1970-71 (2.28 hectares) fell to 1.55 hectares in 1990-91 and 1.15 hectares in 2010-11, showing a consistent decline over all the Census periods. Scheduled Caste groups had 12.36 per cent of holdings in 2010-11 (12.44 per cent in 2005-06), while the proportion of operated area for Scheduled Castes to the total operated area remained fixed at 8.0 per cent between 2005-06 and 2010-11. Of the 17.10 million holdings that belonged to Scheduled Castes in 2010-11, males possessed 87.73 per cent (89.14 per cent in 2005-06) and females had 12.27 per cent (10.86 per cent in 2005-06). Scheduled Tribes had 8.68 per cent of holdings in 2010-11 (8 per cent in 2005-06) and the operated area they held increased from 10.69 per cent in 2005-06 to 11.42 per cent in 2010-11. Of the 12.01 million holdings belonging to Scheduled Tribes in 2010-11, males had 88.7 per cent and females 11.3 per cent; the holdings belonging to females increased from 9.6 per cent in 2005-06 to 11.3 per cent in 2010-11. Of the net irrigated area of 64.57 million hectares, marginal and small holdings formed 48 per cent, medium and semi-medium holdings 44 per cent, and large holdings 8 per cent. Tube-wells were the largest source of irrigation (29.16 million hectares), followed by canals (16.91 million hectares), wells (11.92 million hectares) and tanks (2.25 million hectares). The gross irrigated area was about 87.77 million hectares, forming 45.30 per cent of the gross cropped area and 45.70 per cent of the net sown area. The percentage of net irrigated area to net sown area was lowest in large holdings (37.57). The ‘cropping intensity’, or the number of times a crop grows in an area in an agricultural year, was 1.37 in 2010-11 (1.32 in 2005-06) and Chandigarh recorded the highest share of 1.989, followed by Punjab (1.965) and Haryana (1.889). Cereals formed 57 per cent of the gross cropped area in 2010-11 while ‘all food crops’, consisting of cereals, pulses, sugarcane, spices, fruits and vegetables, formed 76.33 per cent. Factoids and Focus compiled by Tanuj Raut.